Thornless Blackberry plants are a developed cultivar of the common blackberry that provide a high cropping blackberry that is (almost) thornless. Thornless Blackberries will fruit from January through to March depending on conditions. make a wonderful addition to the home garden. Thornless blackberry plants are sold as bare rooted canes during winter when dormant. They will grow to nearly 2m and will need some support to keep them in an upright growing position. Fruit is ripe when nice and dark and beginning to turn soft. ‘Chester’ is the name of the most popular thornless blackberry cultivar. ‘Waldo’ is fairly easy variety of thornless blackberry to grow, although it will need support. Large sweet fruit, well suited to the home garden. ‘Thornfree’, ‘Chester’ and ‘Adrienne’ are other varieties offered. Thornless Blackberries perform best in a sunny position in a humus rich well drained soil. Best grown on a trellis about 2m tall, and should be netted using bird netting when fruiting to prevent crop loss. Prune old and weak canes after fruiting. New shoots should be tied into bunches and left as these will be the new fruiting shoots. 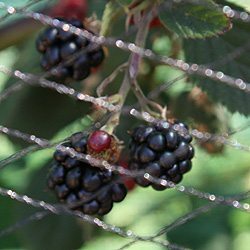 Try growing thornless blackberries in a large pot or container with a climbing frame, if you keep them well watered and fertilized they will produce masses of fruit in the summer months. Or grow along a fence in an espalier type of situation. In winter when plants are dormant, they are easily posted at this time, ready for immediate planting.